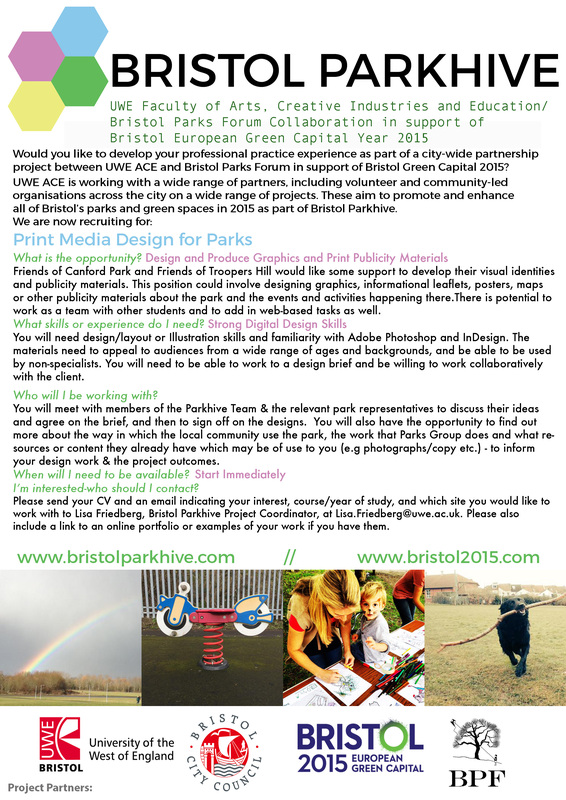 At Bristol Parkhive, we aim to promote the great work done by neighbourhood parks groups, as they work to maintain and improve their local parks and green spaces. Friends of Canford Park and Friends of Troopers Hill would like some support to develop their visual identities and publicity materials. If you would like to get involved in a self-contained project as part of Bristol Green Capital- this could be for you. This position could involve designing graphics, informational leaflets, posters, maps or other publicity materials about the park and the events and activities happening there. There is potential to work as a team with other students and to add in web-based tasks as well. You will meet with members of the Parkhive Team & the relevant park representatives to discuss their ideas and agree on the brief, and then to sign off on the designs. You will also have the opportunity to find out more about the way in which the local community use the park, the work that Parks Group does and what resources or content they already have which may be of use to you (e.g photographs/copy etc.) - to inform your design work & the project outcomes. Skills & Attributes required: You will need design and/or illustration skills and be able to communicate your ideas effectively to non-specialists, as well as having familiarity with Adobe Photoshop and InDesign. You will need to be able to work to a design brief and be willing to work collaboratively with the client. Suited for: This is an excellent opportunity for Graphic Design, Illustration, Drawing or Fine Art students to work on a professional live brief, and gain valuable experience working with a client, all while making a real difference in the community! APPLICATION PROCEDURES: Please send your CV and an email indicating your interest, course, and year of study, to Lisa Friedberg, Bristol Parkhive Project Coordinator, at Lisa.Friedberg@uwe.ac.uk. Please also include a link to an online portfolio or examples of your work if you have them.